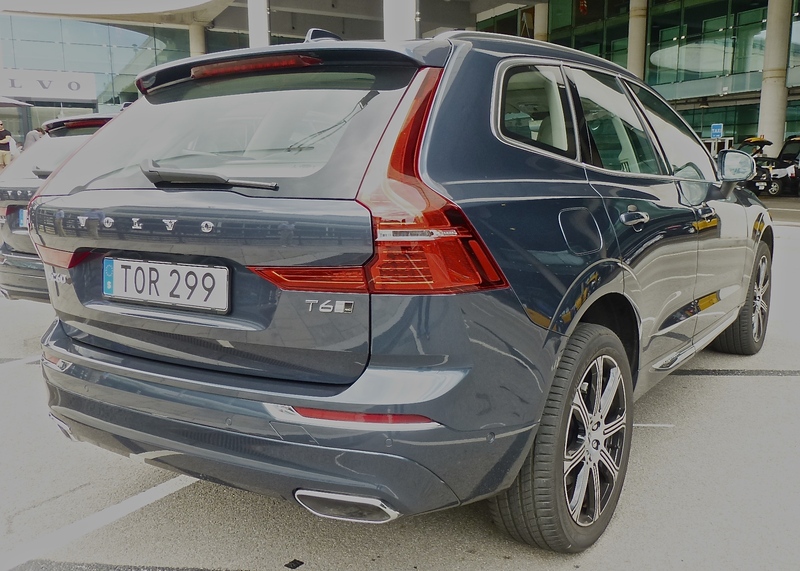 The midsize Volvo XC60 expands on the successful features of the XC90. 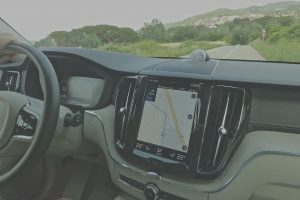 Driving in Spain is a colorful adventure that I had experienced once before, so I felt somewhat familiar during the global auto media’s first opportunity to drive Volvo’s new XC60, the all-new midsize derivative of its superb XC90 SUV. Volvo stressed the quick and agile handling of the smaller and lighter vehicle with the same powertrain as the larger XC90, which collaborated with Spain’s freeway exits to instantly become more concise than words could describe. On the North American side of the Atlantic, our freeway exits are usually pretty straightforward — you see the exit and veer onto it, heading for another freeway. In Spain, the freeway system was added to centuries-old cities and rural regions, so it’s a little trickier. Often, you head onto an exit and find it immediately splits right and left. I learned this on my first driving trip to Spain, for the splendid S90 Volvo sedan. On this trip, our total test drive route was programmed into the navigation setting of our T6 all-wheel drive XC60, so we were informed of upcoming moves by a “Nav Lady,” whom we shall refer to as a “Nav Seniorita” for the sake of geographic accuracy. I drove first, so my co-driver/passenger — a Californian who shall be called “Billy” — could check out the wonderful scenery along and just inland from the Mediterranean without worrying about directions. Reduced length eliminates third-row seat, but the XC60 has adequate room inside. I swerved very abruptly back to the right, still missing the barrier with ease and getting back onto the exit, as the XC60 held its attitude with more poise than its driver, who might have been reflecting the adrenaline rush rising to max. I spotted the split immediately ahead and stayed left, making it smoothly. I was impressed that I had reacted instantaneously twice, with two very abrupt left-right swerves at highway speed, and more impressed that the XC60 got it right-on, even while our Nav Seniorita was a bit premature with her counter-direction. The vehicle carried out my impulses without any squeals of complaint or any hint of body roll. Inadvertent or not, it’s always nice to get a real-world example of a vehicle’s features rather than just to accepting marketing claims. We believed them when they talked about the lighter and smaller XC60 having better agility than the XC90, because in totally revising the XC60, Volvo took the XC90’s SPA — Scalable Product Architecture — shortened it, and installed the same high-tech powertrains from the XC90 with all-new suspension stuff. Luxurious leather abounds on the inside of the XC60, and the seats are exceptional. 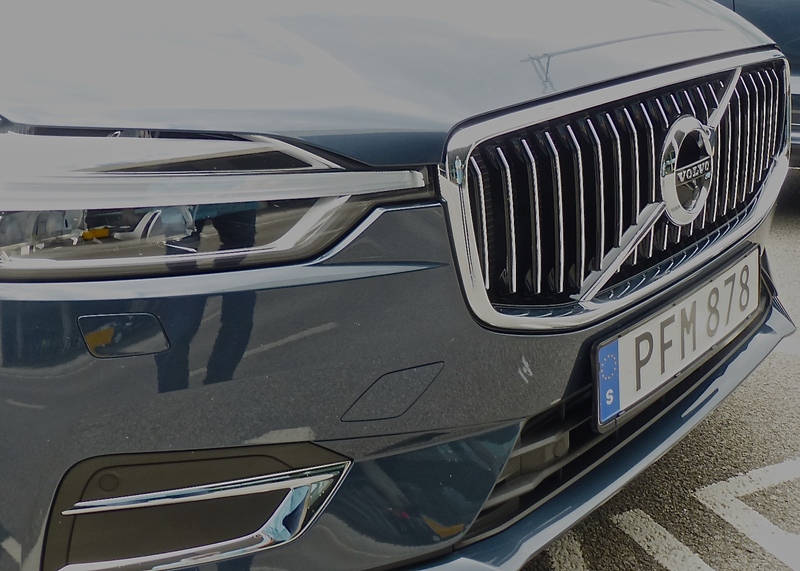 Volvo had previously introduced the new S90 sedan, which shares the XC90’s full-length platform, at a global media introduction in Spain, down the coast a ways in Malaga, which is closer to Gibralter, while Barcelona is around the coastal contours and northward, closer to Italy. The Miramar Hotel, located out by itself with a dazzling view out to the Mediterranean, was our home base this time. The XC90 has met with universal favor, and my evaluation was that it was the finest large SUV I had ever been in or driven. Period. The XC60 is smaller, about identical in size to the Audi Q5, the BMW X3 and the Mercedes GLC 300, to name three of the XC60’s most challenging luxury SUV competitors. Looking like an artfully reduced XC90, the leaner XC60 is eager to run with the same powertrain outlay. Volvo’s SPA is planted firmly on the shortened dimensions, so the XC60 exhibits the same firmness and ride stability. It is similarly built of much high-strength steel of maximum stiffness, and has, under the hood, the direct-injected 2.0-liter 4-cylinder engine that is either turbocharged to bring it up to speed, or pushed with both supercharging and turbocharging to put it over the top. A hybrid version will follow, with an improved LG electric propulsion system on the rear wheels for a unique all-wheel-drive plan. Volvo’s uncompromising safety shell features unbendable Boron steel in the pillars. Dean Shaw, vice president of corporate communication, sounded almost wistful when he described Volvo’s transformation since leaving Ford’s umbrella and being bought by the Zhejiang Geely holding company in China. “We had nothing, 10 years ago,” Shaw said. “Platforms, powertrains…We had to develop everything ourselves. The XC90, the S90 and now the XC60 are all on our larger vehicle platform, and we are all-in on our 4-cylinder, including Drive-E and hybrids. The XC60 we drove was the T6, which is supercharged and turbocharged to deliver 316 horsepower and 295 foot-pounds of torque. That’s up from the T5 model’s 250/250, but lower than the combined gas-electric kick of 400 horsepower and 472 foot-pounds in the top hybrid model. 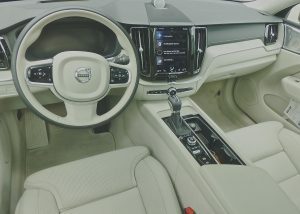 Those engines can be chosen by the buyer and placed in three basic models, with the well-equipped “Momentum” starting at $42,495 including destination, and which will comprise 50 percent of customers, Volvo figures. The top “Inscription” model starts at $46,295 and has a vast array of equipment. The middle model is the sporty R-Design, which starts at $45,795 and adds the flair of all sorts of sporty features. 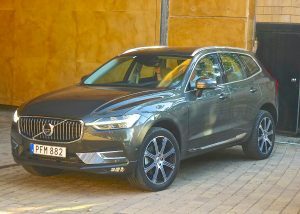 Those prices are almost right on the nose with the comparable AWD Audi, BMW and Mercedes competitors, and while, without a doubt, the XC60 looks at least as good as those German stalwarts, it has standard equipment that, if available, would boost the price of those rivals up by several thousand. Those competitors all have exemplary driving manners, but the XC60 was also impressive on freeways, through city streets, or around and through any and all mountain roadways, where mature trees were stationed like sentries where a shoulder might logically have been. 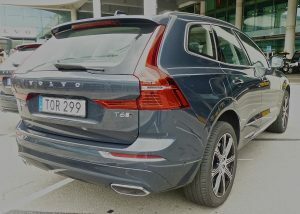 All XC60 models start with a standard equipment list that includes remote start, run-off-road mitigation and off-road protection, lane-keeping aid, oncoming lane mitigation, driver alert control, road-sign information, rear parking assist camera, collision avoidance and City Safety ability to dodge or brake when an object appears ahead, automatic braking after collision, low and high speed collision mitigation, roll stability control. Then there are packaged options that include panoramic moonroof, LED headlights and taillights, rain-sensing wipers with integrated washers, leather upholstery, 10-way power front seats, Volvo 9-inch touchscreen, 10-speaker audio with 10 speakers and 330 watts of power, and smart-phone connectivity from Apple Car Play and Android Auto. Clean, no-gimmick dash and instruments made it easy to admire the Spanish countryside. All of this in a tightly designed midsize vehicle. 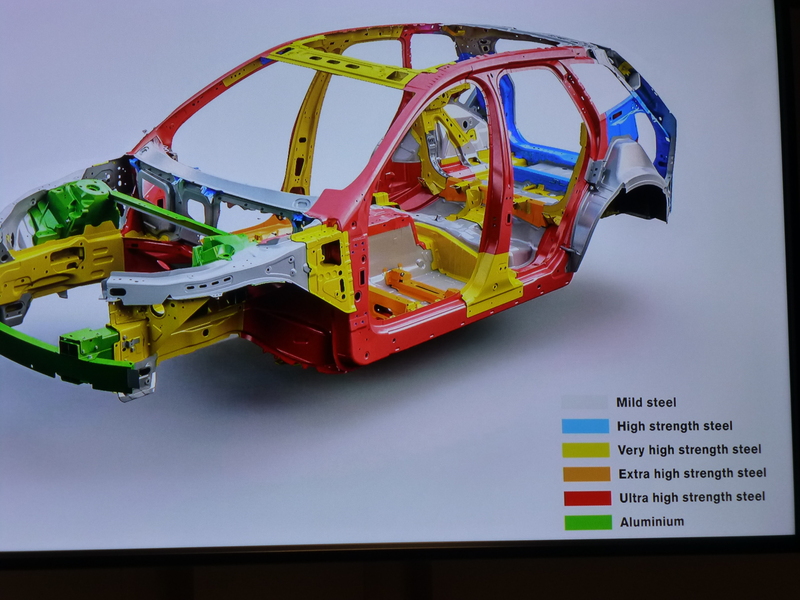 “We knew exactly what we wanted for the car’s behavior,” said vehicle design manager Stepan Karlsson. “We call it ‘Inspired confidence,’ where we called the XC90 ‘relaxed confidence.’ Safety is so ingrained in everything we do, and in the XC60 we installed double-wishbone suspension in front, for better grip and much better response. It’s fun and safer when the car does what you intend it to do. All of those details made my friend Billy and me absorb much of the sensory overload as we switched off driving and passengering. The power was abundant, and the suspension responded without any hint of losing stability no matter how quickly we might swerve with the very precise and responsive steering. 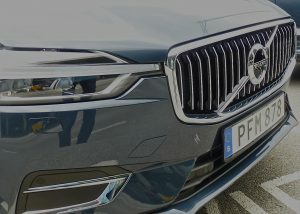 XC60 grille gets its own design, making it familiar and yet unique. Listening to Graeme McInally, from Volvo’s extensive safety laboratories in Gothenburg, Sweden, describe how computers combine lane mitigation, blind-spot detection and steering assist, it was easy to look ahead to Pilot Assist, which is a semi-autonomous driving assist on highways marked with lane and outer stripes, and can keep your Volvo in its lane with light to moderate pressure on the steering wheel up to 80 mph. The compact size of the XC60 didn’t seem to be a problem. As a dedicated believer that you should buy a vehicle that is big enough for your family’s needs, but anything bigger than “big enough” is too big, the XC60 provides a well-designed possibility. I said that the XC90 was the finest SUV I had ever driven, but if you don’t need the third-row seats and have enough cargo room, the XC60 might be even better. “The XC90 has established high expectations,” said Volvo product technical spokesman Jim Nichols. Looking at the slightly convex grille, the stylish contours along the sides, and the tapered-in side windows, it seems clear that the XC60 has lived up to those expectations.